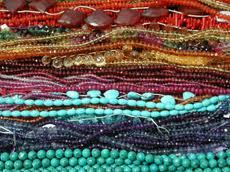 In jewelry making, what is usually used to polish a dull looking semi-precious stone? I’m new at this and don’t know much of anything about beading or jewelry making yet, just one wiring class at a local bead store. When I see semi-precious stones in other people’s handmade jewelry, the stones are almost always polished looking. I bought a strand of tiny amethyst stones & various other pieces the other day to start experimenting with. But I noticed that the amethyst looks dull. I never see dull looking stones like that on Etsy jewelry or at craft festivals. There must be a way to polish or shine it up? Hopefully a way that doesn’t require buying even more loads of expensive tools & materials. How can I polish/shine semi-precious stones? Can I just buy some kind of special liquid solution to rub onto the stone with a cloth to polish it? If so, is there also a special cloth I should use, or is any fabric fine to use? Thanks for your help! You use stones to polish stones in a stone tumbler. There are also polishing cloths, but they are very time consuming unless the stone is already smoothed down around the edges. Help! What are these semi precious stones called? I’m trying to label what my jewelry is made out of, but rats, I can’t find some of the tubes that the beads came in. One looks like it could be a type of colored quartz. It’s green but much yellower and lighter than adventurine. The other one could be a stone or a shell. It’s opaque and a pale sandy gold, kind of old lady’s necklace color with a lot of natural gloss. The green one may be peridot – and the other sounds like amber – but without pictures its impossible to be certain. Where is a good place to sell handcrafted Christian cross/crucifix sculptures? I am currently working on a series of beautiful beadwork crosses in hand crafted wood frames. They are intended as table decorations or shrine centerpieces and are crafted of imported exotic woods and precious and semi-precious stone beads. The retail price will likely be $200-$300, depending on size. I’m not sure where the best place to showcase them online would be. Does anyone have any suggestions? Thanks!